New sixth generation MiniFlex benchtop X-ray diffractometer is a multipurpose powder diffraction analytical instrument that can determine: crystalline phase identification (phase ID) and quantification, percent (%) crystallinity, crystallite size and strain, lattice parameter refinement, Rietveld refinement, and molecular structure. It is widely used in research, especially in material science and chemistry, as well as in industry for research and quality control. It is the newest addition to the MiniFlex series of benchtop X-ray diffraction analyzers from Rigaku, which began with the introduction of the original MiniFlex XRD system decades ago. MiniFlex XRD system delivers speed and sensitivity through innovative technology advances, including the HyPix-400 MF 2D hybrid pixel array detector (HPAD) together with an available 600 W X-ray source and new 8-position automatic sample changer. This new direct photon counting detector enables high-speed, low-noise data collection and may be operated in 0D and 1D modes for conventional XRD analysis and 2D mode for samples with coarse grain size and/or preferred orientation. A variety of X-ray tube anodes – along with a range of sample rotation and positioning accessories, together with a variety of temperature attachments – are offered to ensure that the MiniFlex X-ray diffraction (XRD) system is versatile enough to perform challenging qualitative and quantitative analyses of a broad range of samples, whether performing research or routine quality control. The new (Gen 6) MiniFlex X-ray diffractometer system embodies the Rigaku philosophy of “Leading with Innovation” by offering the world’s most advanced benchtop system for powder diffractometry. 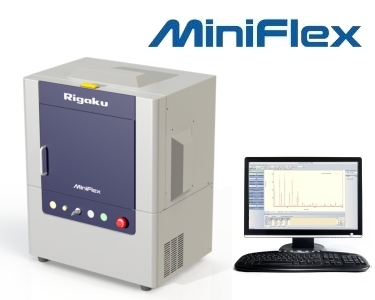 Each MiniFlex comes standard with the latest version of PDXL, Rigaku's full-function powder diffraction analysis package. The latest version of PDXL offers important new functionality; including a fundamental parameter method (FP) for more accurate peak calculation, phase identification using the Crystallography Open Database (COD), and a wizard for ab inito crystal structure analysis. The Rigaku MiniFlex X-ray diffractometer (XRD) is historically significant in that it was the first commercial benchtop (tabletop or desktop) X-ray diffractometry instrument. When introduced in 1973, the original Miniflex™ benchtop XRD was about one-tenth the size, and dramatically less expensive, than conventional X-ray diffraction (XRD) equipment of the period. The original instrument (Gen 1), and its successor that was introduced in 1976 (Gen 2), employed a horizontal goniometer with data output provided by an internal strip chart recorder. The third generation (Gen 3) benchtop diffractometer, introduced in 1995, was called Miniflex+. It provided a dramatic advance in X-ray power to 450 watts (by operating at 30kV and 15mA) and Windows® PC computer control. Both the Miniflex+ and the succeeding generations of bench diffractometers employ a vertical goniometer and allow the use of an automatic sample changer. The fourth generation (Gen 4) Miniflex II benchtop XRD was introduced in 2006 and offered the advance of a monochromatic X-ray source and a D/teX Ultra 1D silicon strip detector. The fifth generation (Gen 5) MiniFlex600 desktop XRD, introduced in 2012, built upon this legacy with 600W of available power and new PDXL powder diffraction software. Materials Science has become an essential part of both industrial and academic research. At today's universities the education of future material scientists is essential to help further on going technological advancement. As part of this course of study hands on experience with IR, Raman, TEM, SEM and XRD measurement techniques is important in teaching students the skills required for the analysis of advanced materials. The MiniFlex benchtop XRD system is an easy-to-use, cost-effective way to bring XRD experiments into the teaching laboratory. Powder X-ray diffractometers can readily measure bulk samples provided techniques are devised for sample preparation. In the case of samples in sheet form, such as paper or film, a diffraction pattern with no angular error can be obtained, as shown in Fig. 1, by: (1) Cut the sample to the same size as the aluminum sample plate, (2) Stacking the sample and sample plate, and (3) Set the sample plate into the sample clip. If the sample has enough rigidity and thickness, it should be placed directly onto the sample clip, without using the aluminum sample plate. Powder X-ray diffractometers can readily measure bulk samples if techniques are devised for sample preparation, and measurement conditions are properly set. When measuring samples which have curved surfaces, such as pharmaceutical tablets and ball bearings, various effects are seen due to the curvature, such as shifting of the diffraction angle and widening of the full width at half maximum. In polymer materials processed into the shape of fibers or films, the molecular axes align in the direction of stretching. Therefore, when these types of material are measured, diffraction lines due to crystal faces in specific orientations are observed to be large (preferred orientation). By using this characteristic, and measuring while varying the placement of the sample relative to the scan axis, it is possible to investigate the direction of the molecular axes with respect to the material. In this case, the transmission method is used together with the reflection method. What do you think about when you hear the word chocolate? Yummy! Dark or milk? If you look at the back of your unsweetened/baking cocoa or chocolate you may expect to see cocoa or chocolate. Yes, but what else do you see? You may see "contains X% protein" or "Y% fat and fiber", perhaps more. Dietitians beware; this can significantly alter your caloric intake. Many people use the terms chocolate and cocoa interchangeably. X-ray diffraction (XRD) in the food and candy industry is crucial to producing a quality product. You would not want to have coconut flavoring in your plain dark chocolate bar or a sweet chocolate to be too bitter. Below is a diffractogram of the milk chocolate specimen shown at the right. The first set of peaks in red is sucrose. The second set in blue is lactose hydrate (essentially dehydrated milk). Finally a few peaks in purple down at 2-7° 2θ can be identified corresponding to the chocolate. Barite is primarily used in the oil drilling industry for lubrication of their drill bits during the drilling and cutting process. It is also used in a variety of other applications including pigments, inks, plastics and X-rays. The density and color of this natural mineral make this a valuable product. However, in each application the purity and composition of the contaminants should be closely monitored as it may alter the properties and function of the barite material. Shown in the provided diffractogram is a sample of barite collected on the MiniFlex. Aluminum oxide or corundum is a commonly available material. However, trace levels of contaminants in the crystal structure of aluminum oxide can result in priceless gems, such as rubies, sapphires, and emeralds. Rubies are corundum with chromium contaminants. It's the chromium that produces the deep red color. Next to diamonds, rubies are the most precious gems. Sapphires come in many different colors: yellow, red, pink, and the more traditional color, blue. The blue color is only possible when titanium and iron are both present in the structure. With the MiniFlex300/600, it is possible to select a fine focus tube (focal point size 0.4 x 8 mm²) in addition to a normal focus tube (focal point size 1 x 10 mm²) of the type generally used with powder X-ray diffractometers. Fig. 1 shows an overlay of diffraction peaks obtained by measuring with a normal focus tube and fine focus tube. Table 1 shows a comparison of intensity, and full width at half maximum (FWHM), which varies proportionally with resolution. The width of the standard incident and receiving Soller slits of the MiniFlex300/600 is 5°, but to obtain high-resolution it is possible to select a width of 2.5° (incident/receiving Soller slits) or a width of 0.5° (receiving Soller slit only). Fig. 1 shows a comparison of the X-ray diffraction profiles of LaB₆ powder when the Soller slit is changed, and Table 1 shows the intensity ratios, and the full width at half maximum (FWHM), which varies proportionally with resolution. Pictured below is a diffractogram comparing the adhesive side of duct tape from different manufacturers. It is used as part of the material identification in forensic labs as every manufacturer uses a slightly different adhesive and a slightly different upper refractory surface with a different web support structure. An XRD scan of the upper surface, using Rigaku's MiniFlex benchtop diffractometer, combined with a scan of the adhesive side is sufficient to identify the duct tape to a specific manufacturer. X-ray diffraction (XRD) is an effective method for determination of the phase composition of unknown crystalline and amorphous materials. The analysis is performed by comparing diffraction peak positions and intensity values with the reference patterns of known compounds maintained in the ICDD Powder Diffraction File (PDF). Routine characterization is completed quickly with a minimum of operator involvement. Subsequent analyses, including quantitative analysis of identified phases, are easily accomplished. Fig. 1 shows the appearance of the MiniFlex300 main unit. The main unit dimensions are 560(W) x 530(D) x 700(H) mm. The water cooling system is integrated into the rear of the unit, so the diffractometer can be setup and used virtually anywhere, as shown in Fig. 2. Fig. 1 shows the appearance of the MiniFlex600 main unit. The main unit dimensions are 560(W) x 460(D) x 700(H) mm. With a newly developed X-ray generator, it is possible to obtain measurement data with 1.5 times the X-ray diffraction intensity of the previous model, the MiniFlex II. This makes it possible to obtain diffraction intensity approaching that of full-sized models. Fig. 2 shows an intensity comparison between the MiniFlex600, MiniFlex300 and the previous MiniFlex II model. Forensic analysis on drugs and pharmaceuticals using XRD identifies compound purity and composition. The analysis is non-destructive and sensitive to the presence of both polymorphs and contaminants. Polymorphs are substances which are chemically identical but have different chemical activity in certain environments, like dextrose and levulose (two forms of C6H12O6). Only dextrose is useful to most life forms. A number of instruments can determine the difference between them, but XRD can do it in their solid (crystalline) forms. Forensic laboratories are frequently asked to verify vehicle types or to corroborate eye-witness testimonies. With a sample of the automobile paint and the MiniFlex benchtop X-ray diffractometer, this becomes an achievable assignment! Automobile manufacturer use slightly different paint components and pigments for every model of their vehicles. Every year, the paint formulas change. Using X-ray diffraction, the paint and pigment compositions can be to identified. X-ray diffraction (XRD) is an excellent analysis technique for identifying unknown solid materials. The XRD pattern can act as a fingerprint to identify unknown materials in crystalline and semi-crystalline samples. The MiniFlex300/600 can be equipped with the D/teX Ultra high-speed 1-dimensional detector to obtain greater intensity. By using this detector, it is possible to obtain intensity a few tens to roughly 100 times greater than with a scintillation counter, and this enables a dramatic shortening of measurement time. Fig. 1 shows the diffraction profiles obtained with a scintillation counter and the D/teX Ultra high-speed 1-dimensional detector. The D/teX Ultra detector measures data faster because it can measure a wide range of 2θ simultaneously with good angular resolution. The MiniFlex300/600 can be equipped with the D/teX Ultra high-speed 1-dimensional detector to obtain greater intensity. By using this detector, it is possible to obtain intensity a few tens to roughly 100 times greater than a scintillation counter. Using this feature, it is possible to greatly reduce measurement time, detect trace components, and measure micro-samples with high sensitivity. Fig. 1 shows the diffraction profiles obtained with a scintillation counter and the D/teX Ultra high-speed 1-dimensional detector. Fig. 1 shows the X-ray diffraction pattern and qualitative analysis results obtained by measuring a sample in which corundum (weight 0.2 mg) was placed on a non-reflective sample plate. Intensity sufficient for conducting qualitative analysis was attained with a measurement time of 1 minute or less. The MiniFlex300/600 can be equipped with the D/teX Ultra high-speed 1-dimensional detector to obtain greater intensity. This detector energy resolution, so fluorescent X-rays can be removed from the diffraction pattern without using a diffracted beam monochromator. Fig. 1 shows the X-ray diffraction patterns from measuring hematite in the standard energy range (standard mode) and the energy range enabling removal of fluorescent X-rays due to iron (fluorescent X-ray reduction mode). With the MiniFlex300/600, it is possible to install a graphite monochromator for a scintillation counter, of the type used in high-grade, standalone, general-purpose equipment. By using a monochromator, it is possible to obtain an X-ray diffraction pattern with high P/B ratio because the monochromator can remove interfering components such as continuous X-rays produced by the X-ray tube, Kβ-rays, and fluorescent X-rays from the sample. Fig. 1 shows the X-ray diffraction pattern for hematite, measured using the Kβ filter method and the graphite monochromator method. For industrial samples, quality control or failure analysis is vital to future product improvements. This polypropylene coated metal sample failed quality control tests due to poor coating adhesions. A section of the coating was removed and the entire sample was inserted in the MiniFlex for testing. Fossils of an extinct nautilus-like marine mollusk are commonly known as ammonites. The name is believed to be derived from their spiral shape, which resemble the Egyptian god Ammon's hat made from a ram's horn. Figure 1 shows the inside cleaved halves (left) and inside and outside surfaces (right) of an ammonite fossil. Phase identification using X-ray diffraction (XRD) works much like fingerprint analysis. XRD patterns are collected on unknown samples and compared to patterns obtained from known materials. The primary database for these XRD patterns is compiled and maintained by the International Center for Diffraction Data (ICDD). In some industrial cases the preferred XRD patterns for optimal analysis of a specific process may not be present in the ICDD database. Connemara Marble is unique in the sense that it is only found in one place on earth - in Galway County on the scenic west coast of Ireland. Inland from this coastal region is a series of 12 mountains known as the 12 Bens. This is where the unique marble is quarried. A combination of different types of minerals is what makes this beautiful green marble so unique. The oil drilling industry can encounter a wide variety of samples, including rocks, scales, cements, cuttings, and muds throughout the drilling process. X-ray diffraction (XRD) is an essential tool for phase identification analysis of these commonly identified solids in the oil field. Three phases are identified in the figure below; the major is a barite phase and the two minor phases consist of calcite and quartz. The primary goal of this application is to quickly identify the phases contained within the sample material. Forensic science is deeply involved with solving the unknown. Any evidence that may be obtained can help in a particular situation; the hair on the floor or the gun casing on the table. What about the powder in the oven, such as the one observed in Figure 1? What is it? A common marketing approach in the cosmetics industry today is the branding of natural products. These natural cosmetics claim to use natural ingredients for effects such shine, whitening, and sun protection. X-ray diffraction (XRD ) is an excellent technique to identify the composition of materials in the cosmetics industry. As an example four brands of so called "natural" cosmetic foundations were analyzed for composition using the MiniFlex benchtop diffractometer. The scans and phase identification results can be seen in figures 1 through 4. In the case of liquid samples, or samples comprised of fine powder, the sample surface must be covered in order to prevent solvent evaporation or scattering of fine particles. Two types of sunscreen lotion were measured by mounting a liquid sample holder to a benchtop X-ray diffractometer. Ensuring quality control can be a daunting task in industrial processes. The key to a quality product is to maintain that quality throughout the entire process and having the appropriate materials is essential to this accomplishment. The wrong materials could alter the properties of the desired product. It could even change the product and everyone would certainly want the finished product to be able to function with its desired task. Observe the white powder in Figure 1. In the radial tire industry, stainless steel wires are used extensively. These wires are coated with brass (Cu, Zn alloys) and can contain two separate phases of brass, alpha and beta. Ideally, these wire coatings should be completely or predominantly alpha-phase brass. If the beta phase concentration becomes too large, it affects the wire strength while pulling through the dyes and causes the wire to snap. The beta phase also decreases the adherence of the wires to rubber, resulting in a weakening in the overall tire strength. Zeolites are commonly used in a vast variety of industrial applications, including environmental clean-up, petroleum cracking, filtering/separations and cation exchange. These materials can be mined from natural sources or can be commercially synthesized. A basic structure of five silicon and aluminum tetrahedra result in a cage-like structure with large open spaces or "pores". These pores have charged regions which attract or exchange cations. For effective activity and specific cation incorporation, the zeolites need to be very specific and pure. Anhydrite or anhydrous calcium sulfate (CaSO4) is an important naturally-occurring compound found in many limestone formations and karst topography. This material has recently gained more significance to the cement industry as a substitute for gypsum—calcium sulfate dihydrate (CaSO4·2H2O). Anhydrite shows great efficacy as a cement setting retardant. This allows valuable time for other phases to form which enhances the cement's tensile properties. Steels and steel alloys are an essential component in many everyday applications. Quality control is crucial to maintaining the structural stability of these materials. During the processing of these heat-treated steel alloys, austenite may be retained which could weaken the overall structural integrity of the material used to build our buildings, cars, bridges and much more. In this experiment retained austenite analysis was performed on a typical metal sample. TiO2 is widely used in white pigments, electronics materials, optical catalysts and UV absorbents. It exists in three polymorphs: rutile, anatase and brookite. The efficiencies of rutile and anatase as optical catalysts are different, so a method to determine the rutile:anatase ratio is needed. The quickest way to do quantitative XRD analysis is to determine the RIR (Relative Intensity Ratio). Data from the MiniFlex, profiled below, is of a prepared mixture of rutile and anatase in a 3:1 ratio. Petroleum products are essential to the world's operation. In order to keep the petroleum industries flowing, scale buildup must be reduced. Whether your interest is in scales, cuttings, cements or muds in the drilling industry; phase identification analysis using X-ray diffraction (XRD) is an important tool in this industry. The primary goal of this application is to quickly identify the phases contained within the sample material. Data collection with the MiniFlex combined with data reduction and Search/Match analysis using the Jade software package made simple work out of this material. Shale and slate are sometimes used interchangeably, but the materials are not the same. Many of the items sold today for landscaping (flagstones, retaining walls) and construction (chalkboards, roofing tiles, pool tables, etc.) uses as "slate " is actually the much more inferior form—shale. Shale is sedimentary rock, lightly compacted into thin, crumbly layers. It may contain high concentrations of quartz, feldspars, pyrites amorphous silica, and clay minerals: illite, kaolinite, chlorite and smectite (montmorillionite). Molybdenum silicide (MoSi₂) is a refractory ceramic and often used in heating elements. In production of MoSi₂, other Mo-Si intermetallic compounds such as Mo₅Si₃ could form. It is important to analyze the purity of MoSi₂ to control the properties of the heating elements. Powder XRD method is suitable to quantify MoSi₂ purity since it can clearly differentiate MoSi₂ from other Mo-Si intermetallic compounds. With the MiniFlex300/600, it is possible to select Soller slits with small widths in order to obtain high resolution. In particular, the 0.5° receiving Soller slit and the 5 mm or 2 mm incident high limiting (DHL) slits can suppress the axial divergence, or umbrella effect which is prominent on the low-angle side. Fig. 1 shows a comparison of the X-ray diffraction profiles of zeolite-A when the receiving Soller slit and DHL are changed (the incident Soller slit is 2.5°). Intensity is normalized, and the actual intensity ratios are as shown in Table 1. Many products are not regulated by a governing body. Quality control is in the hands of those who use these products. For example, Figure 1 shows a white powder from a bottle labeled "talc." When this powder was run on the MiniFlex, talc was observed only in trace quantities (Figure 2). Talc is typically identified as magnesium silicate hydroxide. However, this material is primarily composed of calcite and dolomite identified as calcium/magnesium carbonate (Figure 3). XRD can be used to validate minting ages of coins. A 2005 US penny has a zinc metal core and a combination Cu/Nickel alloy coating. Before 1986, the US pennies were comprised entirely of a copper and zinc alloy. When looking at the diffraction patterns from a MiniFlex in the figures it can be seen that no zinc core was discovered in the 1985 penny. The MiniFlex300/600 can be equipped with the D/teX Ultra high-speed 1-dimensional detector to obtain greater intensity. This detector has a broad detection surface and can efficiently count diffraction X-rays from a sample. As a result, it is possible to obtain intensities from a few tens to roughly 100 times greater than a scintillation counter. Background can also be reduced using the fluorescent X-ray reduction mode, or knife edge etc. Fig. 1 shows the X-ray diffraction patterns obtained when a knife edge is installed versus no knife edge. What do greenhouse gases, pearls, antacids, lasers, cement and sea shells have in common? What do greenhouse gases, pearls, antacids, lasers, cement and sea shells have in common? They are all related to calcium carbonate phases. Calcium carbonate is one of the most commonly occurring natural minerals. It can be observed in three different forms, calcite, aragonite and vaterite. Figure 1 shows the calcite and aragonite forms. These forms share the exact same chemical formula, but have a slightly different crystal structure and are known as polymorphs. Polymorphs have different energies of activation, dissolution rates and degrees of reactivity. Read more about What do greenhouse gases, pearls, antacids, lasers, cement and sea shells have in common? Ever wonder why that particular pastry is so good? Well the food science industry does! They closely monitor the composition of their products to ensure that it continues to taste, smell and look appealing. Of the many analytical techniques used for quality control, X-ray diffraction ("XRD") is probably one of the least advertised but most widely employed. This technique is used for everything from compound identification, quality control, quantification, and even to measure crystalline quality. Read more about What's in your pastry? Figure 1 shows a diffraction pattern of Painaway, an over-the-counter headache product containing caffeine, aspirin (acetylsalicyclic acid), and acetaminophen. This combination of compounds with caffeine makes the product much more effective. Using the MiniFlex benchtop XRD system, the individual components can easily be determined. The peak positions for caffeine are identified by the purple lines, aspirin positions are marked by the blue lines and the acetaminophen positions are marked by the red lines. While it can be very difficult to confirm that something is a meteorite, the presence of several minerals along with other physical characteristics often provides evidence. Coesite and stishovite (SiO2) are the two key indicator silicon oxides found in meteorites and asteroids. They are formed under high pressure and high temperature conditions that meteorites or asteroids experience during an impact event. Automatic 8-position sample changer is compact and rugged. Integrated spinning improves particle statistics in polycrystalline sample measurements. Fully automatic alignment. Programmable. Various sample holder are available to meet the specific needs of particular applications. The graphite monochromator optimizes sensitivity by lowering the background level. It improves signal-to-noise by eliminating fluorescence from Mn, Fe, Co, and Ni containing materials. An enclosed sample holder is available for users studying materials that might degrade in the presence of oxygen. This 1D silicon strip detector is optionally available for fast, high-resolution scanning. The high temperature attachment can heat a sample to do in-situ powder diffraction measurements under high temperature conditions from ambient to 500°C. Advanced hybrid array pixel detector (HPAD) with zero background noise, an active area of ​​400 mm2, spatial resolution of 100 μm, and maximum count rate of 106 cps/pixel or more. HyPix-400 can operate in 0D, 1D or 2D modes. PDXL is a one-stop full-function powder diffraction analysis software suite. The modular design, advanced engine and user-friendly GUI have been satisfying both experienced and novice users since PDXL was released in 2007. PDXL provides various analysis tools such as automatic phase identification, quantitative analysis, crystallite-size analysis, lattice constants refinement, Rietveld analysis, ab initio structure determination, etc. The peak shape in a powder diffraction pattern would appear to be a delta function if measured under ideal conditions. In reality, the peak shape changes depending on a number of measurement conditions: wavelength distribution of the source, optical systems, slit conditions, crystallite size and strain, and so on. The peak shapes obtained from measurements made under real-world conditions are described using an empirical function such as a split pseudo-Voigt function, or a split Pearson VII function which has a good agreement with the obtained peak shapes. The fundamental parameter method (FP method) is a method to calculate peak shape by convolution of the shapes caused by all the instrumental and sample conditions. The Crystallography Open Database (COD) is a free, public-domain database of the crystal structures published in International Union of Crystallography, Mineralogical Society of America and so on. PDXL can incorporate both ICDD/PDF-2 and COD to perform automatic phase identification, adding the COD library of over 150,000 crystal structures to PDXL 2’s already substantial capabilities. Recently, there have been many published examples of ab initio crystal structure analysis performed on powder diffraction data. This development is attributed primarily to significant improvements in PC processing speed and in the efficiency of the algorithms used for structure determination. The PDXL clustering feature can group multiple scan data based on the similarity of powder diffraction patterns and peak positions, and displays the grouped data in an easy-to-read tree. This is particularly effective when it comes to classifying and screening the data from a large number of scans. If you are unable to view this video, click here to download it (317 MB). If you are unable to view this video, click here to download it (51 MB).